Greetings everyone, it’s been quite some time since my last tutorial here! After much work, I finally had some time to whip out this quick tutorial on how to create somewhat of a ‘watercolor stop motion’ style within After Effects. Not quite the best looking effect, but it really did please the client (of course I spent a lot more time tweaking it than in this tutorial.) Also, many thanks to Aharon Rabinowitz for reaching out to me and giving me some handy tips! 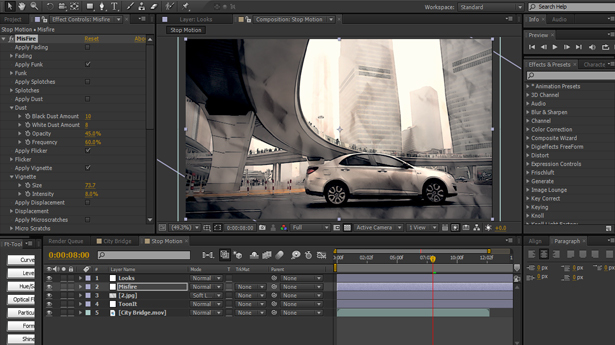 We will be discussing how to achieve a choppy looking footage, as well as stylizing it a bit using ToonIt. We will then proceed to texture it up with a paper texture and some other organic elements using MisFire. To finish it up, we’ll do some color correction and color grading using Magic Bullet Looks to smooth things together and tie it all down. Removing detail from the BG layer with Toonit so the forground elelements pop a bit more. Severly limited the color palate using Looks. A video with millions of colors comes off a fake. For paintings, I also slowed the speed by half, so that it felt more like it flowed. For paintings I also added a texture of the canvas. I animated it in some cases to give it a more frenetic feel. For Paintings, using one of the paint styles in ToonIt. Any motion I wanted to add back in to the camera was done with AE. Pan, zoom, shake. Once again, many thanks to Aharon for the wonderful tips. If you want to give ToonIt, MisFire, or Magic Bullet Looks a try, you can visit Red Giant’s website for a free demo. Check out Aharon’s tutorial on Getting Better Results Going from Video to Cartoon and Sketchy Stop Motion Text Look.